Geraniol is a natural active ingredient of plant origin used in veterinary medicine mainly in dogs and cats against some external parasites (lice, fleas, flies, etc). It is also used against agricultural and household pests. Main veterinary parasites controlled: fleas, lice, ticks, etc. Mechanism of action: Extremely little is known about the mechanism of action of geraniol in insects. There are reports that it affects chitin in the cuticle causing dehydration and suffocation. A larvicidal and ovicidal effect has also been reported for some species, as well as a repellent effect on certain mosquitoes and ticks. A "crushing" efficacy should not be expected from natural products, comparable to that of modern synthetic insecticides, which are more potent and persistent than any natural compound. Simplifying, it can be said that natural active ingredients can be useful in places or seasons with low parasite challenge, but may be insufficient for controlling well established parasite populations (fleas, ticks, mites, etc.) in pets, let alone in livestock. Geraniol is a moderate skin irritant and can cause allergies. Exposed to air, its oxidation products are more irritant and allergenic. Otherwise geraniol is considered as rather safe for humans, domestic animals and the environment. Geraniol is the main component (70-85%) in the essential oil of palmarosa (Cymbopogon martinii) and is also very abundant in rose and citronella oils. Nowadays it is produced either through industrial extraction from such oils, through chemical synthesis, or through genetically engineered microorganisms. Use in human medicine: Yes, mainly in traditional medicine in some cultures. 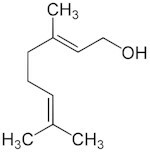 Geraniol is a monoterpenoid and al alcohol naturally produced by numerous plants. 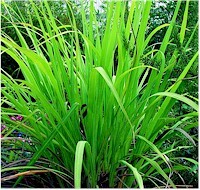 It makes 70-85% of palmarosa oil (Cymbopogon martinii). It has a characteristic rose odor that makes it an important constituent of many flagrances in perfumes and cosmetics, in the food industry and in home-care products. It is also used in the industrial production of citronellal and citronellol, and as an additive in the tobacco industry. Direct usage as an insecticides is very modest, only in horticulture, against a few domestic pests (cockroaches, ants, termites, etc) or against a few pet parasites (fleas, lice, ticks), but more as a repellent than as insecticide. It is also used a few as a fungicide in agriculture. Geraniol shares two features with many other natural insecticides: it is rather volatile and is unstable when exposed to sunlight. Consequently its effect in animals exposed to sunlight is very short: a few days or even only a few hours. This means that protection of the treated animals against re-infestations (residual effect) is virtually inexistent. This is particularly unfavorable for livestock that would need to be treated very frequently. However, for the same reason they do not leave chemical residues in food commodities (meat, milk, eggs, etc. ), which is a benefit sought by organic producers.